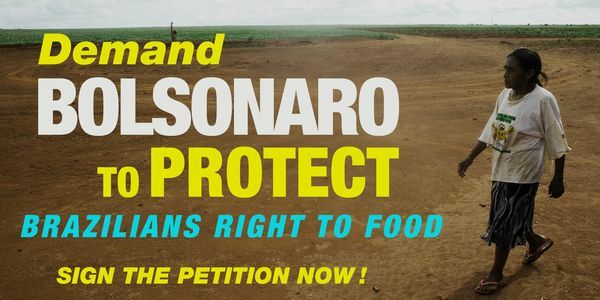 On January 1st, 2019, Brazil's President Jair Bolsonaro issued Provisional Measure Nº 870, which, among numerous decisions, repeals provisions in the Brazilian Organic Law on Food and Nutrition Security (Losan), approved by the National Congress in 2006. Losan's fundamental objective is to structure the national system of public policies for the realization of the Human Right to Adequate Food. The changes profoundly hamper the functioning of the National System of Food and Nutrition Security (Sisan) by extinguishing the National Council for Food and Nutrition Security (CONSEA). Throughout its history, the Council has been an example of representing the most different sectors of Brazilian society, especially those that suffer the most from the consequences of food insecurity. The demands, experiences and proposals of these sectors have contributed decisively to the improvement and proposition of new public policies. It is in the CONSEA that the dialogue between civil society and government has been taking place in a legitimate and institutional way for the formulation of public policies to guarantee a healthy diet for the whole population. In this regard, the following achievements can be cited: the inclusion of the right to food in the Brazilian Federal Constitution, the approval of the Organic Law, the National Plan for Food and Nutrition Security, the Harvest Plan for Family Agriculture, the National Policy on Agroecology and Organic Production, the Food Acquisition Program and food purchases from family agriculture by the National School Feeding Program and by other public agencies. The results of this process have led to important improvements in the quality of life of the Brazilian population, especially the most vulnerable, and have removed Brazil from the FAO Hunger Map in 2014. In parallel to addressing the problem of hunger, actions have also been taken to deal with the rise of obesity and other non-communicable diseases, that are of serious concern in Brazil. Therefore, the governance model in Food and Nutrition Security and CONSEA's experience have been internationally recognized and served as inspiration for many countries. Thus, aware of the role of CONSEA in these achievements, defenders who we are of democratic spaces for the formulation of public policies, we ask that the CONSEA extinction decision be reviewed. CONSEA needs to continue its work in this Decade of Action on Nutrition, which has been proclaimed at the UN General Assembly in 2016, thanks to Brazil's leadership role.